RECENTLY I saw a sculpture by the American artist Jonathan Borofski. It consists of three wooden cut-out men with hinged jaws. The jaws move up and down, powered by a small electric motor and accompanied by an incessant chattering noise. For obvious reasons, he named it ‘Three Chattering Men’. Perhaps Borofski was alluding to the fact that there is so much noise in this world and so little of significance. However, as I was looking at the quaint artwork a fellow visitor at the museum gallery had another take. “This reminds me of the fact that those of us who have not achieved competency in public speaking might appear to be merely chattering when speaking before an audience. Perhaps that’s what Borofski is saying,” she said. Now, having pondered on this for a while and reflecting on the recent utterances by a few politicians, I’ve come to realise that there is another situation where speeches can be just chattering. One, as the afore-mentioned, is caused by incompetence; the other that I am going to talk about is driven by intention. I am talking about the situation where leaders make impressive sounding clarion calls about the importance of harmony and unity in our multi-ethnic, multicultural country and yet at the same time appear to be tacitly supporting open divisive action by some racist groups. So he did just that. As the feather came floating down on the multitude below, the chant ‘take my heart, your majesty’ got louder and louder. Just then a strong gush of wind blew up from below, sending the feather up and up into the air. Amazed, the Chancellor looked down and was astounded with what he saw. Below, thousands and thousands were shouting and making the verbal pledge to give their hearts to the king but at the same time everyone to the man was blowing up frantically to push the feather away from his head. Yes, a speech can be most eloquently delivered but if the action that follows contradicts it then it is no better than mere chattering. So we have two situations that can render a speech useless: one is caused by incompetence while the other is driven by … well, perhaps I leave it to the readers to fill in the adjective. In the case of the incompetent speaker there is hope. Public speaking is a skill. Like all skills it can be taught and learned. The 2010 British historical drama film ‘The King’s Speech’ portrayed this point effectively. The movie won an Oscar. The movie is about a future king, George VI of Britain, overcoming his speech impediment and stage fright through coaching and training to deliver an impressive wartime radio broadcast on Britain’s declaration of war on Germany in 1939. The case of the inability to ‘walk the talk’ is a more complicated issue. There may be many extenuating circumstances that can prevent a speaker from carrying out his words but inevitably it carries damaging implications. A leader who indulges in that habitually would certainly lose credibility. 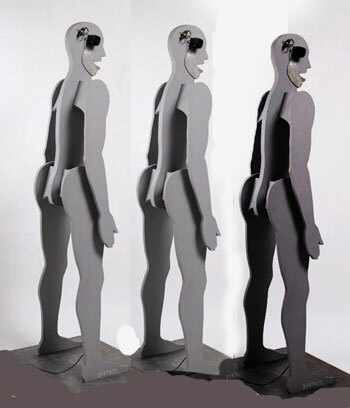 I understand that the sculpture, ‘Three Chattering Men’, gets moved around to different museums and galleries. So it should. I saw it in Japan. Perhaps one day it might be displayed here in Malaysia.